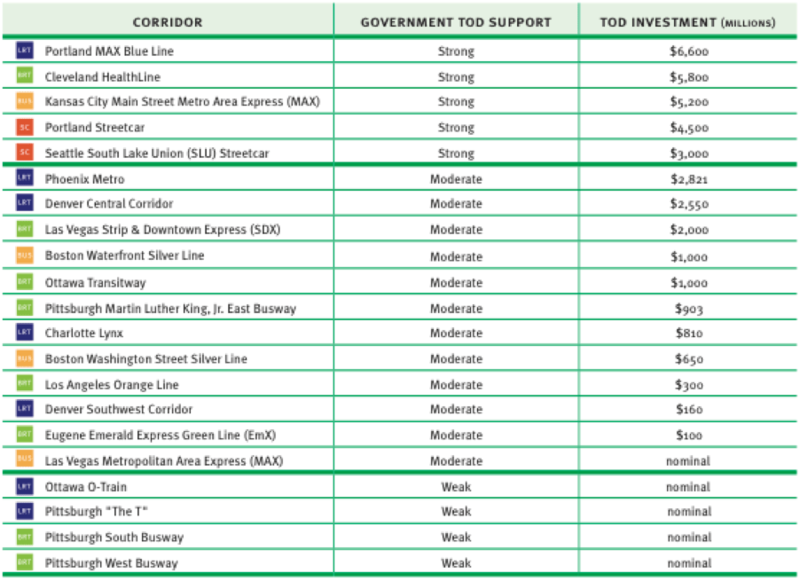 In a new report making the rounds this week, “More Development For Your Transit Dollar: An Analysis of 21 North American Transit Corridors,” the Institute for Transportation and Development Policy does two things. First, authors Walter Hook, Stephanie Lotshaw, and Annie Weinstock evaluate which factors determine the impact of urban transit on development, coming up with some extremely useful and not necessarily intuitive results. Second, they show that BRT projects — only a few of which exist in the U.S. — can in fact spur walkable development. Then the authors go a step further, asserting in no uncertain terms that good bus projects yield more development bang for the buck than equivalent rail projects. ITDP examined 21 light rail, streetcar, and bus routes in 13 cities across the U.S. and Canada to determine how transit lines affect development. While the report does pick a side in the BRT-vs.-rail debate, ITDP found that three factors are much more powerful determinants than transit type in the outcome of transit-oriented development. First, what ITDP calls “government intervention” is key. There is a direct correlation between robust TOD investment and robust public policy. Everything from assembling the needed land to offering incentives for tenants falls under the umbrella of government intervention, but perhaps the most important aspect is to make sure the zoning near transit encourages mixed-use, walkable development. One of the best things policy makers can do, said Weinstock, is to limit parking. She said that the city of Ottawa’s downtown parking restrictions were a huge boost to transit ridership on the Transitway, a bus rapid transit line which blew every other line ITDP studied out of the water with 244,000 weekday riders (four times more than the next runner-up, Denver’s Central Corridor light rail line). After government intervention, the next most important factor in successful TOD was the development potential of the land surrounding the new transit. 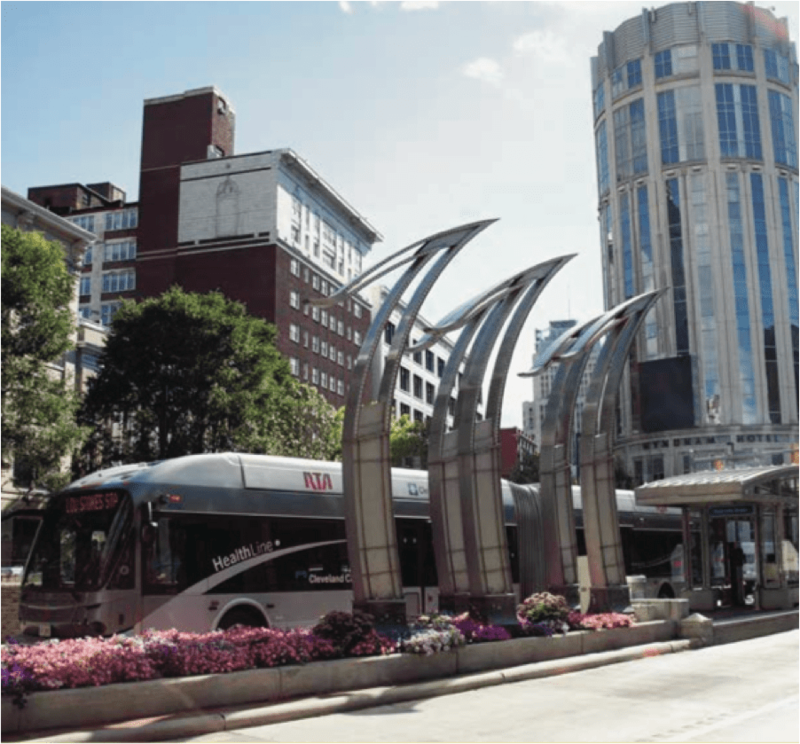 Cleveland has a weak land market but still saw billions in development follow the implementation of the HealthLine BRT route on Euclid Avenue. The corridor is an “emerging” real estate market, the “most interesting” kind, according to ITDP, because the impact of the transit is most apparent. Strong markets are going to develop no matter what, and weak ones won’t — but well-placed, well-conceived transit can make a big difference in an area on the cusp. Back to the Ottawa Transitway for a moment. Perhaps part of the reason it boasts such high ridership is that it goes incredibly fast, reaching average speeds of 50 mph. That’s the third major factor ITDP found in TOD success: the quality of the transit. The authors determined transit quality by measuring all 21 lines against ITDP’s own BRT Standard grading system. Still, quality was not a very strong factor in TOD compared to public policy and development potential. Of the five lines with the greatest amount of TOD investment, two were ranked silver and three were “below basic.” Of the 11 transit lines with moderate TOD impact, most of them were of bronze-level quality. Probably the most talked-about aspect of ITDP’s report are the calculations about how much transit-oriented development was spurred by each project, per dollar spent to build it. The results are fairly wow-worthy. Portland’s light rail Blue Line has turned construction staging sites and parking lots into affordable housing and mixed-use development. And Cleveland has seen everything from hospitals to hotels boom along Euclid Avenue since the advent of the HealthLine BRT route a few years ago. But Portland’s transit line cost 34 times more to build. So while Cleveland has seen $114.54 in TOD for every dollar it invested in bus rapid transit, Portland has only seen $3.74. But cities can find ways to make bus projects super expensive, too. As the ITDP report notes, simple bus service in Boston ended up costing $70 million per mile — “comparable to the most expensive LRT corridor” — because the city built an expensive new tunnel for it. How Should Different Modes Be Compared? ITDP also dismisses much of the development around Portland’s MAX line as being unrelated to the transit. But the vast majority of the development around Cleveland’s HealthLine was centered around the Cleveland Clinic and other area medical centers [PDF]. Which came first, the promise of good transit, or decisions by hospitals to expand? The answer isn’t clear. But this report does represent a “coming out” for the very concept of bus-based transit oriented development. For too long, the identification of “transit oriented development” (TOD) with rail has bordered on tautological: if there wasn’t rail, it was less likely to be called a TOD, no matter how useful the bus service was. For any transit project, a major distinction is whether the vehicles have a dedicated right-of-way or have to run in mixed traffic. ITDP’s report shows that if public officials are willing to give rail or buses enough space, in the right place, with smart policies to support TOD, the investment will pay off regardless of mode. UPDATED 6:04 p.m. to correct information about TOD around Portland’s Blue Line. I’ve taken a tour of the HealthLine. I’ve also toured East Liberty, mentioned in ITDP’s article. Both are wonderful success stories of real estate value creation in slower growing locales, but I’d pause before linking it to BRT and touting its cost-benefit potential. Correlation is not causation. In Cleveland, the HealthLine connects downtown to (in order) Cleveland State, the Cleveland Clinic, and a range of educational and cultural institutions in University Circle. A good chunk of the real estate development has come from these institutional actors, not the private market. Transit provided the connection between these institutions and allowed them to leverage their expansions together to impact property values up and down Euclid. But to me, the headline should be “Transit creates value when it connects anchor institutions”, NOT “BRT creates value more cheaply than LRT or other modes”. Same deal in Pittsburgh. Was it the busway or was it community institutions, a targeted investment in a ped bridge, and an incubator linked to the University that made East Lib possible? I’d contend the latter. In fact, the Port Authority there is playing “catch up” to create a more TOD-friendly station near a Target and Whole Foods that already came online. I’m all for BRT, and Cleveland and Pittsburgh should be proud of what they’ve accomplished. But when one starts touting the cost benefit ratio, it gives transportation planners an excuse to opt for cheaper alternatives. A high quality, well designed, and attractive transit system creates the most value in new development. I worry that this report will give communities more license to cheap out. It’s Portland’s 1st Streetcar line that helped the Pearl District’s development, not the MAX Blue Line. ITDP sounds dangerously like a bunch of shrill mode ideologues. Is the Reason Foundation behind this or something? Even if we’re satisfied that they could somehow control the factors going into success of these different services in vastly different settings, comparing some ratio of upfront capital expenses to private investment by mode borders on sophistry. Operating costs and normal replacement are huge factors too, and they happen in the future. While this certainly isn’t enough to rule out BRT under all circumstances, it’s fair to say replacement costs of buses are significantly higher because their useful service lives are much shorter (1-2 decades vs. 3-4) – and that’s on top of the higher operating costs Weinstock acknowledges. should be especial red flags that she is backbending. There may be a gray area where that it is true, but if ridership is high enough – which I think should be the point – it mostly just means you need more buses to move as many people as a train. The report is better than its findings. It spends 56 pages talking about how policies shape TOD, but everyone’s only focusing on technology — and nowhere, besides the almost outlandish Cleveland claims, does it actually make a compelling case for BRT. Over $1B of the purported TOD benefit of the HealthLine stems from major expansion projects at the Cleveland Clinic which certainly would have happened regardless of transit. I haven’t found an updated breakdown of that “$6 billion” since the 2009 Plain Dealer tabulation (yet the figure keeps growing), but half of what the PD counted consisted of hospital, university, and museum buildings that were completed or planned before the HealthLine opened. East Liberty is an equally puzzling case study to profile: much of the development “credited” to the BRT happened decades after the BRT opened, some is auto-oriented to traffic sewers running through the neighborhood, and much of it exists just because the old streetcar hub was the only reasonably flat site for big-box retail in the middle of Pittsburgh’s hilly East End. The headline “dollars of development per dollar of transit investment” chart doesn’t rigorously source or even define the “dollars of development,” simply taking the agencies’ word as gospel. Without a standardized metric for that basic numerator, the metric is useless. The same chart also most definitely does not deem BRT a better investment than rail, as the Portland & Seattle streetcars do very well on the same chart. The only reasonable finding I can glean from that chart: transit ROWs along major streets are better at generating TOD (all of the top performers have at least some sections running in or along streets) than ROWs in highways, freight RR corridors, etc., which often perform poorly at generating TOD (almost all of the worst performers). Did ITDP mention this at all in their rush to proclaim that BRT cures cancer? Of course not. I’m in the same boat as you, especially about Cleveland. Having lived there during the construction and opening of the HealthLine. I mean, I could probably go put a giraffe near the Cleveland Clinic, and surely the Clinic will build another building within the next 24 months (or two). I can publish a study showing that giraffe investment is the best way spur development as cities run around to put giraffe’s across their neighborhoods. With that said, I’m still very pro HealthLine, Cleveland and this major improvement to Cleveland’s network. an auto-industry pr firm generates a report coming out in favor of automobility? surprising. I wish someone would find a way to distinguish between different kinds of “BRT”. In LA we have the Orange Line, which runs on its own guideway through the backyards of a mostly suburban area, and then we “Rapid Buses” which are souped up express bus lines running mostly on existing major transit corridors throughout the City. The TOD dynamics between the two modes are radically different, but they are both “BRT”. Yeah, I’m guessing the ambiguity is deliberate for marketing’s sake. The “rapid transit” in bus rapid transit also seems a little disingenuous – as if it could move as many people as quickly as a subway or something. Excellent rebuttal, Payton. Those are all important points. Other studies have seen that rail transit stops in highway medians and freight rail corridors have a more difficult time attracting ridership and spurring TOD investment. So it stands to reason the same effect would be seen for BRT. I wonder how well the transit planning models account for that effect. It might be cheaper to plop a stop in a highway median, but when you figure the effect of retarded ridership and TOD investment, it might be a better to locate stops in more attractive, potentially walkable surroundings where adjacent TOD can happen. If you go to page 31 of the report, you can see that they use the BRT standard that they designed a few years ago (available here: http://www.itdp.org/microsites/the-brt-standard-2013/) Depending on implementation of various factors, a claimed BRT system can be classified as Gold, Silver, Bronze, Basic, or Below Basic. The Orange Line qualifies as Bronze level (only a couple other projects in the United States even meet that level), while I’m pretty sure the 7xx Rapid Buses count as Below Basic. There’s no doubt that the HealthLine stimulated development along the Euclid Corridor, but I think that much of the development is due to the fact that it calmed traffic on what was previously an extremely congested street. Let’s be honest, the HealthLine is far from rapid (it takes a half hour to travel a meager 5 miles) and the supposed ridership increases it spurred are inflated as they fail to take into account the merger of multiple transit lines into one (i.e., the HealthLine). All of that said, it isn’t bad or great – but it could be much much better. The City of Cleveland and RTA have been unable to time the lights with the buses and a bus stop every quarter mile is much too frequent for a rapid transit line. The street car plus Portland taxpayers giving massive tax breaks to developers resulted in the Pearl District. The study is good until it starts claiming that bus is better than rail. Then it starts making stuff up. Here’s the thing: if a corridor is successful, you’ll want to have more and more service on it. And then it will need so much service that *you can’t serve it with buses*. For this reason, Ottawa’s transitway is being converted to a rail line, as we speak. So if you design a good BRT project, you have to rip it out in a decade and replace it with rail. Why not build rail from the get-go? Taxbreaks aside, it’s sure a hell of a lot nicer than the abandoned warehouses and fields it was 10 years ago. Same with the Seattle Streetcar in South Lake Union. You might want to do some research on them before you call them ideologues. They’re more than just some cheap propaganda machine. Some of the most thoughtful and pragmatic policy I have seen comes directly out of the ITDP. I am sure that the ITDP’s report would make more sense to everyone here if they perhaps knew a bit more about the other work they have already done as well as their positions and beliefs in general. This serves as context for the report. Out of context, the report seems weird. The inclusion of favorable streetcar systems is the ITDP’s attempt at being fair. However, the best streetcar performing streetcars did not do as well as the best BRT in the chart.